NOMA, which recently celebrated its 31st annual fundraising event, Art in Bloom, has a number of exhibitions worth celebrating this spring: Timothy Duffy: Blue Muse (on view April 25 through July 28); Keith Sonnier: Until Today (on view through June 2); and Bondye: Between and Beyond (on view through June 16). As a way of preserving roots music of the American South, Timothy Duffy creates masterful one-of-a-kind portraits of Southern American musicians using tintype photography—a process invented in the United States in the 19th century. His subjects include artists such as local New Orleans legends Alabama Slim, Little Freddie King and Pat “Mother Blues” Cohen. The exhibition features 30 of Duffy’s original unique tintypes, plus an outdoor installment of enormous images on buildings around New Orleans, introducing the public to these musicians. An illustrated book, Blue Muse, published by UNC Press and the New Orleans Museum of Art, also accompanies the exhibition. Meanwhile, Keith Sonnier: Until Today — the first comprehensive museum survey for the artist — explores the influence of Louisiana art and culture. As a pioneering figure in conceptual, post-minimal, video and performance art of the late 1960s, Sonnier is widely recognized for his signature neon works that deviated from much of the abstract art of the time. Sonnier was born in Grand Mamou, Louisiana, in 1941, and his first light pieces were influenced by seeing the way light hit the rice fields in Louisiana. He was one of the first artists to incorporate light in sculpture. The exhibition features more than 20 key artworks and installations created between 1969 and 2018, including some of Sonnier’s illustrious works in neon, as well as rarely exhibited works in sound, satin, radio waves and bamboo. The exhibition is organized by the Parrish Art Museum and is accompanied by a catalogue with essays by curator Jeffrey Grove and NOMA’s Katie Pfohl. Spring Celebration: Art, music, food and mint juleps await at the Girod Street Stroll in Old Mandeville. The 4th annual Girod Street Stroll, taking place April 27 from 5-9 p.m. in Old Mandeville (on Girod Street from the Mandeville Trailhead to the Lakefront), is the perfect place to pick up original art. This popular annual event, organized by the Old Mandeville Business Association, includes food from top local chefs and specialty mint juleps served by more than 30 participating businesses, original art vendors and live music by Neo Brass Band. New for this year’s event, attendees will have a chance to vote on their favorite mint julep. Patrons must purchase a commemorative mint julep cup ($35), which is their ticket to sample all food and beverages at the event — and only 1,500 cups are available. They can be purchased online at oldmandevillebiz.com and picked up at one of the registration areas (Girod Street by the Lakefront or the Mandeville Trailhead) beginning at 3 p.m. on the day of the event. OMBA also will raffle off a live painting of the event, created by New Orleans-based professional artist and performer Andrew Wilkie. 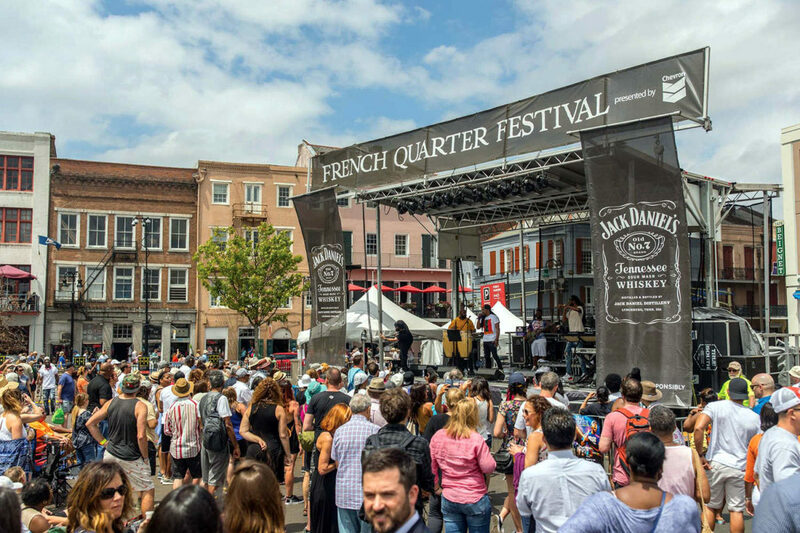 Music in the Air: The French Quarter Festival returns this year, showcasing Louisiana music, food and culture. The French Quarter Festival, presented by Chevron April 11-14, brings more headliners, a new riverfront stage, eight restaurant debuts and more than 1,700 Louisiana musicians to the streets of the Vieux Carré. The expanded Chevron Evening Concert Series will feature more genres nightly, in addition to the Cajun/Zydeco lineup. Meanwhile, a new venue, the Pan-American Life Insurance Group Stage, brings music to the newly renovated Moonwalk on Saturday and Sunday. And at the Jones Walker Let Them Talk Stage at the Jazz Museum at the Mint, attendees will have a rare chance to hear artists speak about their life in music. In Jackson Square, the Hilton Stage will feature an all-star lineup of New Orleans’ most respected artists including Ellis Marsalis, John Boutté, Leroy Jones, Shannon Powell, Robin Barnes and James Andrews. The riverfront Abita Beer Stage will feature four days of music such as Rebirth Brass Band, The Iguanas, and Walter “Wolfman” Washington and the Roadmasters, and the GE Stage returns with every genre from funk to gospel. Artists on the Jack Daniel’s Stage include Brass-A-Holics, Lena Prima, and Rory Danger & the Danger Dangers. At the Tropical Isle Stage, the lineup includes a Sunday morning gospel performance from Betty Winn and One-A-Chord.